…with a pinch of journalism! Community, participation, self-expression and self-reliance are the laws that set of the guidelines for this unique annual experiment capable of gathering over forty-eight thousand people – numbers from the October 2007 edition – prepared to live in a surrealistic alternative society in the middle of the desert for nine whole days. Besides getting the most distinct and elaborate modern artistic manifests together in the same place, the biggest temporary city in the world: Black Rock City (Nevada, USA) also aspires to encourage the integration of all people by creating an unconventional world culture. It all began in 1986, when a little more than half a dozen youthful locals turned a wooden man into a celebration fire in a small west coast beach, on the bay of San Francisco, California. Ever since then, the group of people who give life to this modern utopia only gets bigger and bigger. Idealized and projected by the young American artist Larry Harvey, the Burning Man is today a multimillionaire organization. It is also an eclectic worldwide community that belongs to the cultural expression of all those present to the event. Willing to unify all artistic demonstrations, every new edition has a guiding theme. Having in mind the ecological conscience as an alert to the effects of the misuse and waste of earth’s natural resources, the topic suggested in 2007 was The Green Man, below follows its story. The biggest temporary city in the world doesn’t last long for the public, but the production crew’s work extends to several months before and after the event. All due to the fact that the desert must stay as clean as it was before everyone got there, without any trace of human pollution, since it’s a protected environmental area. 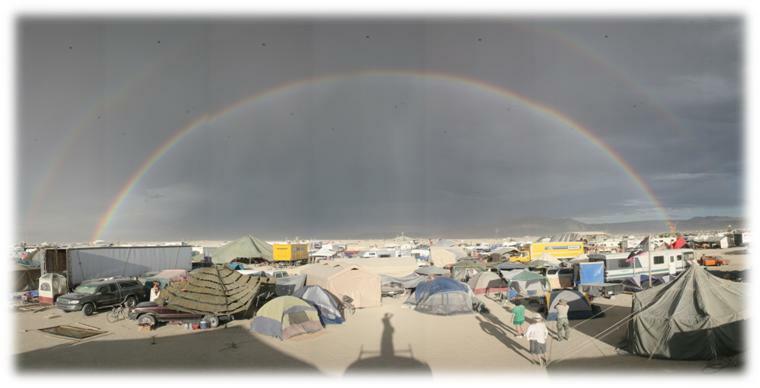 If any kind of trash is found around Black Rock City, the festival’s license may be revoked by the government. Every year the BM traditionally ends on Labor Day. The 2008 edition was themed The American Dream, the 2009 was Evolution and the upcoming one will be Metropolis. Every year the main art projects respond to one specific theme. That makes every new event unique in its own special way. It’s another world, it’s another life, but how long will it last? Muito bacana o seu blog e seus textos! Vou passar um tempo por aqui! Obrigada! E seja bem vindo! -Share these ideas with someone else! LEIA ESTE BLOG EM PORTUGUÊS!